Texas Tuesday is once again upon us, Pint Jockeys. This week we’re profiling one of the hottest Texas craft beers available – Saint Arnold Brewing Co.’s Bishop’s Barrel No. 5. We think it’s safe to say that the Saint Arnold Bishop’s Barrel series is the gift that keeps on giving. No. 5 in this series of releases of barrel-aged beers was just released yesterday. Produced in extremely limited quantities like its predecessors, the good stuff is only available at your favorite bars and restaurants. We’re seeing more than a few trips to your favorite local watering hole in the near future, because this good stuff is WORTH IT. The Bishop’s Barrel series of beers were all aged in barrels specifically chosen to enhance and compliment the characteristics of the underlying beer. This particular recipe was first brewed by Vince Mandeville. Mr. Mandeville’s “Wee Heavy” recipe eventually became Saint Arnold’s Divine Reserve No.4. Originally released in 2007, that brew won a gold medal at the World Beer Cup in 2008 in the Strong Scotch Ale category, and Saint Arnold decided to resurrect it in BB5 due to popular demand. The recipe was re-brewed in December of 2012 and placed into bourbon barrels where it aged for nine months. Now, it comes to you, Pint Jockeys. BB5 is rare, refined and Texas born and bred – just like you like it Pint Jockeys. Have you spotted BB5 yet? Help fill your fellow craft beer lovers out and share when and where in the comments below. For all the statistics on BB5, click here. Cheers to another great Texas Tuesday pick of the week! We’ll see you back next week – same time, same place. We hear another great Saint Arnold brew is about to release, and you can be sure we’ll have ALL the details for you. We have MUCH to celebrate this Texas Tuesday, Pint Jockeys. Mark your calendar, clean your palette and put on your party hat because Saint Arnold Brewing Company is scheduled to release a brand new beer next Monday, August 12th! The latest in their barrel aged series of beers, Bishop’s Barrel Series No.4 – a.k.a “BB4” – is a Weizenbock aged in bourbon barrels with cocoa nibs from Tejas Chocolate. Joining BB1-BB3, BB4 is the latest in this unique series of beers that have been barrel aged in barrels chosen to enhance and complement the characteristics of the underlying beers. Aging times for this series can range from a few months to over a year, but are designed to be enjoyed soon after bottling due to the long amount of time they stew in the barrels. The BB4 brew pours a dark brown color with a very light head with a bourbon, chocolate and banana nose and a taste reminiscent of the perfect banana split, topped with some chocolate ice cream and spiked with a little bourbon. Like we said, Pint Jockeys, put on your party hat for this one. While we tend to think “cold” when we think of frozen treats, the folks at Saint Arnold maintain that the warmer this beer gets the better it tastes, and recommend enjoying it between 55°F and 60°F. Adding to the unique nature of this brew is the small amount of beer produced from the barrels. Due to limited production, Bishop’s Barrel releases are only available at your favorite bars and restaurants… And thus, we think next Monday sounds like a great time to meet up with some fellow Pint Jockeys, and order yourselves some BB4’s. Get em’ while they last, Pint Jockeys! Cheers! Celebrate Texas Independence Day early! Howdy, Pint Jockeys! In honor of the upcoming Texas Independence Day (March 2), this Texas Tuesday we’re highlighting the all-Texas lineup at this week’s tasting events. On Thursday, February 21, craft beer lovers in Beaumont, Texas City and Victoria will be among the first to taste the much-anticipated second release in Saint Arnold’s Bishop’s Barrel series (read a little more about Bishop’s Barrel No. 2 and where to find it below)! Everyone will also enjoy Saint Arnold Spring Bock, Southern Star Pine Belt, Southern Star Old Potentate, Rahr & Sons Iron Thistle and ZiegenBock! The bonus beer in Texas City is Cornel’s Maelstrom. Victoria tasting-goers will sample Lone Star Bock and Beaumonters will enjoy Texas BIG BEER Big Texas Blonde. All tastings are free and open to adults ages 21 and older. We’ll see you at one of the three Del Papa Distribution Centers on Thursday from 5 – 7 p.m.! And now, a quick bit about Saint Arnold’s newly-released Bishop’s Barrel No. 2: It’s an old ale, aged in Chardonnay barrels with cherries for 14 months. The nose is a combination of sour cherry, oaked chardonnay and a wild yeast character. The taste has cherry and light malt up front, chardonnay in the middle and finishes dry with a distinct tartness. The cherry throughout is a light note, never dominating. “BB2” is only available in bars and restaurants, so pay an extra visit your favorite stomping grounds this week. We’ll be posting BB2 sightings on our Facebook page, and you can also search the hashtag #bb2 on Twitter. Unfortunately, it’s almost time to hang up our beads and put away our jester hats – Mardi Gras! Galveston 2013 is coming to a close. But not before a fun and festive Fat Tuesday celebration down on the Island. At 6:30 tonight, come meet us as we watch the Krewe of Aquarius Parade revel alongside the Krewes of Gambrinus, Babalu, Thalasar, Baccus and Z Krewe! As all good things must come to an end, tomorrow we’ll return to our normal lives, void of nightly parades, balcony parties and phenomenal live music. That’s ok, though, because Spring is on the horizon and that means we’ve got some exceptional seasonals and new brews to look forward to, like Saint Arnold Spring Bock. Saint Arnold’s refers to Spring Bock as the “laziest” of its brews because it takes eight weeks to ferment and age. It’s an authentic German-style Bock with a malty, slightly sweet taste. In line with German tradition, the beer is brewed to a high starting gravity, resulting in higher alcohol content – 6.4% ABV. Serve Spring Bock at about 40 degrees along with roasted chicken or grilled game for an enjoyable spring time cookout. 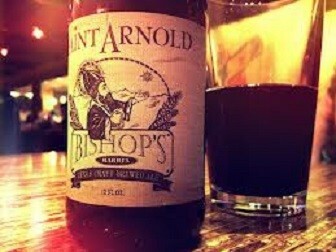 And speaking of Saint Arnold, next Monday the brewery releases its much-anticipated Bishop’s Barrel No. 2, a funky, old-age ale. We can’t wait! Check back on Tuesday for a full post on this new release, and until next time, cheers, Pint Jockeys! Pint Jockeys, rejoice! There are not one but TWO huge opportunities this week for you to taste the latest and greatest in craft beer from across Texas and around the world. The party kicks off this Thursday, January 17 at the first Pint Jockeys tasting of 2013. Visit all three Del Papa Distribution Centers to get a sneak taste of the not-yet-released Budweiser Black Crown. Visitors can also sample Sierra Nevada Bigfoot Barleywine Style Ale, Sierra Nevada Ruthless Rye and Saint Arnold Winter Stout. The Texas City and Victoria tastings will also feature Saint Arnold Icon Red and Beaumont’s bonus beer is the city’s very own Cornel’s Maelstrom, a mild stout Schwartzbier, now available in 22 oz. bottles! Even better, Cornel’s Brewing Company Founder and Brewer Corey Nelson will actually be at the Beaumont tasting to hand deliver his Maelstrom straight to your glass. Despite such an exciting lineup, you may want to pace yourself at our Thursday tasting events, because Friday and Saturday we’re making our way down to Galveston for Yaga’s Chili Quest and Beer Fest and we hope to see you there! With warm chili and over 100 craft beers from around the country, these are the events we live for. Visitors will get a souvenir beer-tasting mug to fill with exclusive specialty and craft beers like Saint Arnold’s Bishops Barrel and Icon Red, Bourbon Barrel Winter Warmer from Rahr and Sons and Black Crown from Budweiser, to name a few. You can find the full lineup here and tell us what you can’t wait to sample in the comments below. We hope to see each of you outat our tasting events on Thursday and then again on Friday and Saturday at Chili Quest and Beer Fest. Please remember to drink responsibly, Pint Jockeys, and use the Yellow Cab Hail a Cab™ app to get home safely with just the push of a button.